Ascending Butterfly: Today's Words of Inspiration: Keep The Dream Alive + Owe you some names! 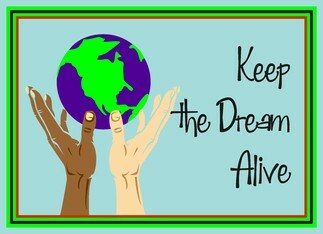 Today's Words of Inspiration: Keep The Dream Alive + Owe you some names! Your key to success today is to "keep the dream alive" no matter what obstacles you face. You may want to check in with yourself to see if you want to keep moving forward in the same direction, and if you have to change that direction, but don't give up if you feel challenged. Your feeling of your purpose or mission is likely to be stronger than usual today; heed that feeling. Today's Challenge: Keep the Faith. The Faith in yourself, in your abilities, and in your Dreams. Let those dreams be the motivator to make the changes you need to make, to get what you want and deserve! Today's Breathing Affirmation: Close your eyes, take a deep, slow breath in through your nose, and affirm "Today I will take action to move closer to making my dreams come true." My apologies for the delay, but all the Dads N Grads Buying Guide Giveaways have finally been closed out, and winners have been drawn and notified. Once all winners confirm, I will post an official winners list for the ShenZhen Knives, SodaStream Genesis Soda Maker, Joya Shoes (5 winners! ), as well as the Smooth Jazz NY Smooth Cruise Winners (2 winners!) Giveaways! If you haven't already done so, don't forget to enter our active giveaway for an Elliott Lucca Drawsting Crossbody Handbag in YOUR choice of color HERE. If you haven't had a chance to read it, please make sure you check out the NY Women's Empowerment Summit 2011 Recap HERE. This is 16 of the most powerful and successful women in their fields who took time out of their busy schedules to help the Make A Wish Foundation who received the proceeds of the ticket sales, and to share their insights, wisdom and what inspires them! It was like having access to high power mentors, and the beauty of it is, that by reading the recap, you can get motivated to push aside your excuses to living the life you both want AND deserve. I want all my Ascending Butterflies to feel empowered to reach for the stars! No matter what your goal is, I want you to come here everyday and find a new inspiration that helps you reach it! What is your Dream? What star are you reaching for? --to be able to pickup my kids by 6 my husband works late and is out of town alot. --the money does not have to be the same as my former job I just need to cover daycare, my lunches, gas, and have about $1000 each month. What steps are you taking today to get closer to getting your sweet shop open? @Vance Creve Something in the school system would be perfect for you! This would allow you the flexibility to pick them up on time, not too much travel and cover basic expenses too! You can do it! What steps are you taking today to get closer to getting a new position?